Tree-lined avenues, historic homes, and eccentric local business make up what is considered one of Denver’s oldest neighborhoods. Consisting of large Victorians, Tudors, Denver Squares, Ranches, and Bungalows, Mayfair offers a variety of architecture styles in which to make your home. Since 1995, the area has experienced the highest appreciation rates of Denver’s inner city neighborhoods, attracting a wide range of buyers looking to live near Rose Hospital and National Jewish Hospital. Homes can run from $500,000 up to over a million. 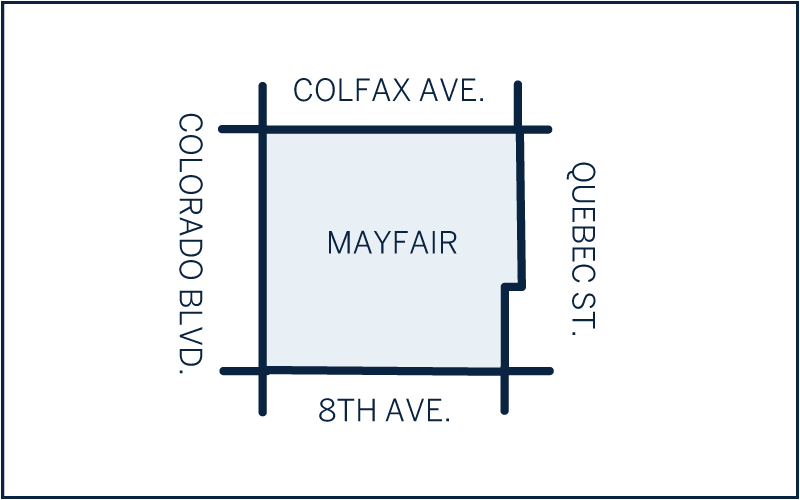 In 2014, the Colfax-Mayfair Business Improvement District was formed after a big push by Mayfair Neighbors to create a local organization with the primary goal to stimulate business in the area. It continually attracts small business, while remaining attractive to young families who enjoy life in a quiet, historic neighborhood.